In 1974, the Van Geest House of Pianos first opened its doors in Waterdown, Ontario. The store was started by Len and Leny Van Geest. Len had been a piano technician since 1959. He learned his skills at the Mason & Risch Piano Co. and the Heintzman Piano Co. Len serviced many pianos in the Hamilton and Burlington areas, including all of the concerts at Hamilton Place. When Len and Leny retired in 1996, the building was sold, but the store, sales and service was transferred to Case Van Geest. Case also learned his skills at the Heintzman Piano Co. from 1972 until 1975. At that time, he started his own piano tuning company. Case looked after many clients in the Burlington, Oakville, Hamilton and Milton areas, including Hamilton Place. He still tunes and services all the pianos sold at Van Geest House of Pianos, including his customers that call him on a regular basis. Van Geest House of Pianos has built a reputation for quality, service and honesty. We are an independent company with no ties to any other store or dealer. We hope that our store will continue to bring music to many homes and families for many more years. Hi , I'm Case Van geest owner and tuner. 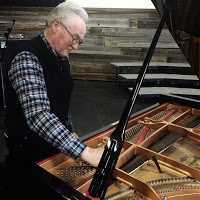 I have been tuning pianos since 1972 (45 years) I'm still looking after concert halls, churches, schools and the area around Waterdown, Hamilton, Burlington and Oakville. Call me at 905-407-2444 to book your appointment.